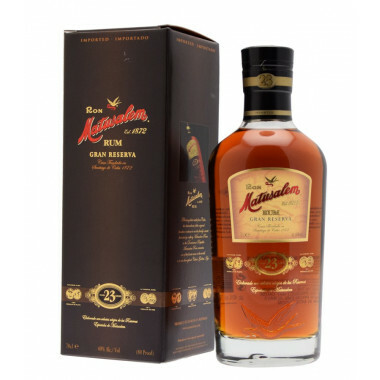 Matusalem Gran Reserva has aged for 23 years in oak casks, and results from various blends of old and young casks. Produced in Dominican Republic from molasses, Matusalem is aged in a solera system, originally used for Sherry wines. Matusalem Gran Reserva has aged for 23 years in oak casks, and results from various blends of old and young casks. This exceptional expression develops floral and oaky flavours with a refined and silky texture. This old rum mingles perfectly rich notes of jam and honey into full-bodied, oaky aromas. It is also called "The Cognac of rums". In the 1930s, Matusalem became the first rum brand in Cuba. Founded in 1872, the distillery developed its secret formula and became hugely successful, until Fidel Castro came into power and sent the Alvarez family into exile. Divisions arose in the family relative to the control of the brand. However in 1995, 5th generation owners of Matusalem Claudio Alvarez reached an agreement with other members of his family. He settled in the Dominican Republic to perpetuate the methods used by his ancestors, yet unchallenged in the world of rum. Made from various carefully selected Caribbean spirits, Matusalem rums are characterized by an extremely rich aromatic complexity, boasting extensive experience in rum ageing and blending. Maturation is done in charred white oak bourbon barrels. Nose: a floral bouquet of candied fruits and jams, mingled in a refined, oaky backdrop. Palate: complex, sweet, offering a wide range of flavours and a subtle, silky, velvety texture coating the mouth. Oaky notes are quite apparent, with strong flavours of nuts and roasted almonds. Finale: quite stylish, extremely sweet with touches of honey and vanilla.